The latest report which shows no significant change in overall performance still last week. Despite all the cancellations, performance of none of the top 10 routes is regarded by GWRC as unsatisfactory. 1.3. NZ Bus has never achieved target. Performance has always been in the “Needs improvement” area, but none of this needed improvement has been delivered – driver shortages are just the most recent manifestation. This is a continuing significant failure on the part of both GWRC and NZ Bus. 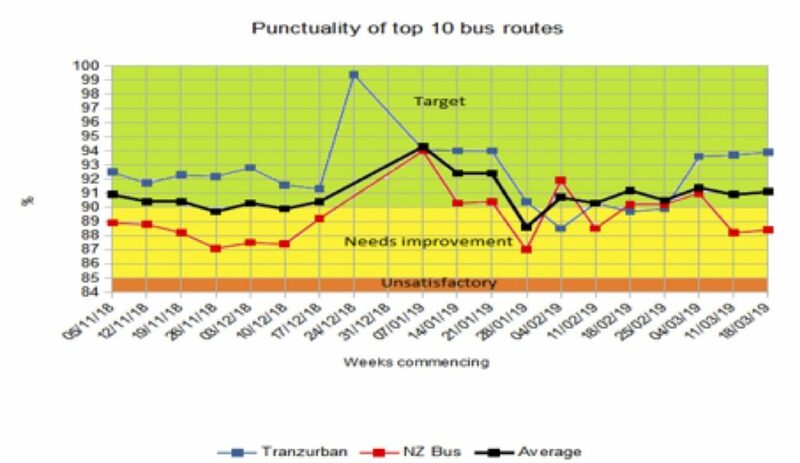 2.1 No significant changes to punctuality, with NZ Bus still needing improvement: average punctuality is still at the same level as it was when this dataset commenced last November. All initiatives to improve performance have been ineffectual. If you’ve noticed coverage is a little “bitsy”, you’re not wrong. These reports and the analysis are done by volunteers.